Its all here in one handy book. All the technical information, and construction plans needed for amateur radio operation. Best of all are the detailed drawings on almost every page. If you have ever wondered how to built an antenna, solder a coax connector or earn a Worked all States (WAS) award its here in simple to read graphic drawings. - This book will help you keep track of what equipment you have purchased. The handy Equipment log on page 4 will be invaluable if anything is ever stolen. - Ever wonder what the range of your transmitter is in miles? 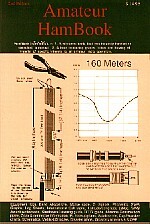 The Transmitter Range Estimator on page 104 will calculate it for you. - Installing a N-Connector is simple using the step by step drawing on page 112. - Is your family ready for a major natural disaster? The plans on page 140 will help get you ready. - How many states have you worked on 40 Meters? See page 28. Band Charts & License allocation charts. Worked all States award forms. Amateur HamBook sell for $14.95.